If you are a romantic soul and a lover of golf as well, then the Love Golfer website will charm you immediately. “Your golf romance awaits you” is written on their home page in flowy romantic font that suggests that this site appeals to all who have a soft side but also love the game of golf. 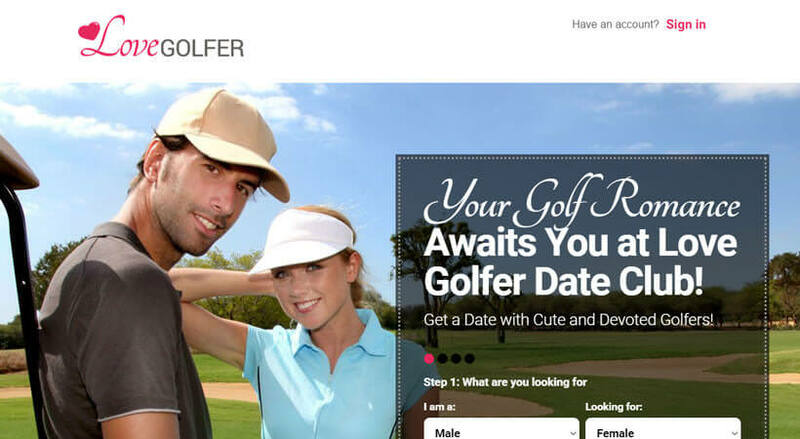 This website stands out among other golfer dating websites thanks to its interesting and appealing design. Our Love Golfer review offers insight into this website, which will be very welcome, if you are thinking about joining in all the golfer fun. The first honest impression when it comes to this website is that a woman had a lot to do with its design. Without any wish to inscribe prejudice, the home page looks indeed warm and homey, and what adds to the fact is the logo which is design in the shades of pink with a little heart over it. Now, the page itself catches the eye of the beholder instantly thanks to the beautiful golfer couple staring back at you from the screen. Their casual smiles are to remind us how Love Golfer offers you a chance to be in the same situation as these good looking young people, who were connected through their love of golf. If you want to see more of what this website has to offer, you are to create an account, which is very easily and quick to do. We already discussed the design a little bit, but it is important to underline that the user experience on this site is very good, the website was created to respond intuitively and help you find whatever you need as fast as possible. Most of the site is devoid of any overbearing decoration, everything is in clean cut patterns and easy to look at, something we were grateful to see after many sites that just seem like they’re trying too hard to deliver a message of love online. One other detail that was interesting to us is the kind of preamble you get on the homepage, in the sense that there is a little text about what the site is all about. These kind words encourage you to explore all the options that Love Golfer has to offer, and it’s a nice touch to give an additional nudge to everyone who’s having second thoughts about whether they should join. Create Your FREE Profile and Meet Single Golfers Today! There is a lot to explore on the Love Golfer website, though it’s safe to say that the features mostly match those you can find on most dating websites on the internet. What makes this site different is that it is “fresh out of the oven,” meaning that the members of this community are still piling up, but there is a lot to look forward to as more and more single golfers join in the fun every day. If you register for free, you get a chance to take a closer look at other members, send flirts (up to 30) and take a look at the profiles of golfers closest to you. If you decide that you want an upgrade, there is a fee to pay, and it varies depending on exactly what you want to do. Chatrooms are also at your disposal, should you have any questions for your fellow golfers or you simply want to get to know the community better. There is both a photo and video gallery, and you will make a better first impression if you upload clear pictures of yourself, preferably in a cheery mood. There is also a list of favorites that you can create, where you can keep all of your favorite people to talk to, especially the ones that show potential for a romance. Love Golfer is a completed dating website with all the features you could possibly need for a great online golfer dating experience. While writing our Love Golfer review, we were pleased to find out that the number of members is multiplying from one day to another, and you can find golfers from many different backgrounds, as well as ones that live close by. When it comes to age, you can also find variety, which makes it easier for you to make good choices about what would be preferable age for your golf partner and potential soul mate. Love Golfer will help you find some interesting people to talk to and share your passion for golf, there’s no doubt about that. All you have to do is invest some of your time in creating a profile and you’ll be ready to meet many of eligible golf players like yourself in need of companionship. In my country club we have an excellent course and we spend a lot of time together playing golf and hanging around, but it’s not a big club and we don’t have that many female members, which is precisely why websites like lovegolfer.com are precious to me. I get to meet ladies who are into golfing and talk to them about our mutual love for this sport, and I don’t even have to leave my office or bedroom to do so. Lovegolfer.com makes my life easier, it’s very well done and extremely convenient, especially since I can even use it on the go, on my phone. I am so happy I discovered this website, by pure accident! I saw the name and I thought to myself, Lola this is something right up your alley. And I wasn’t wrong! I actually met by current girlfriend through this website! We started talking about golf, then about life in general, I asked her out after a few weeks of talking and now we’re officially dating. I love lovegolfer.com, it’s so fun and convenient.